If you are going to buy one book on Greek vases then this is the one to go for. Cheap in price but high in quality, this is a richly illustrated volume which through its easy to use A to Z format answers all the basic questions one might have about Greek pottery. Especially good on what different types of vessels existed and what they were actually used for, there is almost always a helpful photo to explain the text. To note is that the focus of this book is on pottery shapes, production methods and types of decoration rather than an analysis of the subject matter and imagery of the decoration (try J.Boardman's World of Art series for that). The book begins with an historical overview of the evolution of Greek pottery which is followed by an A to Z section on the most influential painters and then the main section on a general A to Z. There is also a rather nice at-a-glance double spread on all the various pottery shapes, a selected bibliography and a brief index. A perfect companion for any museum visit which includes Greek pottery. Cartwright, Mark. 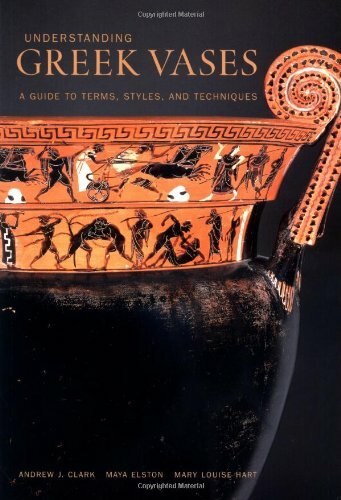 "Understanding Greek Vases: A Guide to Terms, Styles, and Techniques (Looking at Series)." Ancient History Encyclopedia. Last modified April 12, 2013. https://www.ancient.eu/review/31/. Cartwright, Mark. "Understanding Greek Vases: A Guide to Terms, Styles, and Techniques (Looking at Series)." Ancient History Encyclopedia. Ancient History Encyclopedia, 12 Apr 2013. Web. 22 Apr 2019.